So I’ll just come right out and say it. One thing I have done a pretty bad job at in my new life here is trying new Filipino foods. When you visit a new place, all you want to do is try super exotic things and eat street food and take pictures of it and maybe even risk getting a few dreaded drops of water in your system just to get the full experience. You’re fun and adventurous and you soak it up. Well, I moved to a new place and that did not happen to me. I did get some cute and curious neighbors, though. And that is a win. On an all-too-frequent-basis, I have found myself – er, still find myself? – reaching for the PB&Co. Or the Bob’s Red Mill. Or the Baked Doritos (true colors, yo). Instead of taking pictures of the new and exciting foods at the store, I take pictures of myself eating Easy Mac. At home, though. I don’t eat that at the store, but thanks for thinking so highly of me. To my credit, I’ve eaten a lot of mangoes here, so… yeah. Truthfully, I’ve only scratched the surface on making and trying Filipino foods. And now I’m trying to change that. Now that I’m starting to feel a bit more comfortable – yes, it takes me four months to get comfortable, what of it? – I’m gonna try again. I’m not going to hole up in the international section of the grocery store. I’m gonna start buying things like giant bags of pancit canton noodles. And then I’m going to stir fry them with shrimp and veggies and eat em out of the pan. Have you eaten noodles straight out of a pan recently? Please do it. It feels so weirdly satisfying. This is a traditional Filipino noodle dish that is so simple and so full of great flavor. It’s like a glorified ramen. But does that make you want it more or less? Maybe just ignore me. The thick noodles soak up all the flavor of the sauteed onion, chicken stock, soy sauce + fish sauce, and that fresh squeeze of calamansi juice (lime for you). Throw some meat, er, seafood, whatever, in there with the fresh veggies and WOW. It was really, really good. I added cilantro to mine because I couldn’t not do it, but you guys, cilantro is not very Filipino. I wonder if getting myself a third heaping plate of noodles is also not very Filipino. By the way, check out Jun-Blog if you’re looking for some other Filipino yums. Jun’s blog is a winner! 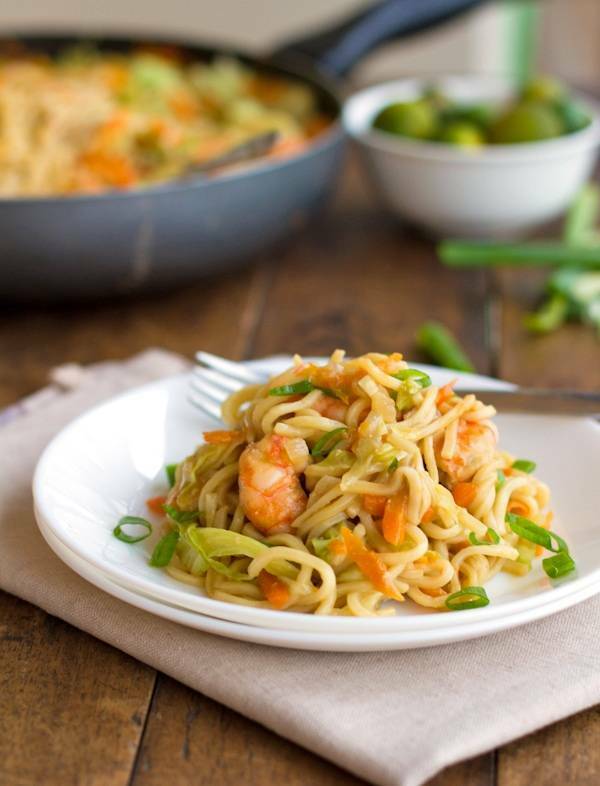 These addicting stir fried noodles are also known as Filipino Pancit Canton. With shrimp, vegetables, and deliciously simple flavors. Mince the garlic and onion. Heat 1 tablespoon of oil in a large skillet. Add garlic and onion and stir-fry until soft, about 3 minutes. Add shrimp and cook, stirring frequently, until no longer translucent, about 3-5 minutes. Remove from heat and set aside. Chop the cabbage and peel and grate the carrot. Add another tablespoon of oil into the skillet and stir fry the vegetables until tender-crisp, about 5 minutes. Remove from heat and set aside. In a large pot, bring the chicken stock, soy sauce, and fish sauce to a boil. Add the pancit noodles and boil until the noodles are soft, about 5 minutes. Add the shrimp and vegetables to the pot and stir to combine. Add the remaining tablespoon of oil to a large skillet and add the contents of the pot. Stir fry the mixture for about 10 minutes. When most of the liquid has been absorbed, remove from heat and stir in the calamansi juice. Top with sliced green onions. You could change up the vegetables with anything that’s in season or that you happen to have on hand. What’s that? Don’t have pancit canton noodles sitting around the house? Me either, and I live in the Philippines. Try your local Asian market – I have a feeling they’d be happy to send you home with a big ol’ bag of the good stuff. Looks super! I love new stir fry recipes. Oh wow this is making me miss the Philippines so much more! Yum! Your pancit looks delicious! And thank you for the Jun-blog shoutout. I always look forward to your tweets and instagrams from the Philippines. And I still owe you a recipe for sapin-sapin. The lighting on these noodles is just gorgeous – magazine quality images! You should be so proud of these photos! Stunning! Thanks Averie! I was kind of struggling with the lighting (it was late afternoon) and then I decided to switch up the angle and BAM. I landed the best lighting ever. 🙂 I love that you notice that stuff! Hey, it’s ok–take the time you need to get through culture shock. I know when we moved from California to NYC (not quite the same, but still!) we spent an awful lot of time perfecting our own homesick Mexican cooking. 🙂 These noodles look great! I love stir fry recipes….that is one of my favorite go to meals…very tasty! Oh! I love a good noodle dish! Looks fantastic! I don’t blame you for taking a while to transition though! You like what you like and are used to! When you say “cabbage”, do you mean the round, sometimes huge, heads that are in all US supermarkets, or are you thinking of the more typically Asian Nappa cabbage? How many cups of chopped cabbage should I shoot for? Mine was green cabbage, not the napa cabbage, but it was rather small. Even still, I probably had at least 4-5 cups of shredded cabbage (before cooking it down). This look looks like it’s right up my alley! I will probably add some sriracha too to kick up the spice! Totally yummy! Love the photos! That looks delicious! Good luck on your culinary adventures in the Philippines. P.S. in addition to lechon, I hoping you get to try kaldereta, afritada, kare-kare, sinigang, and the ever popular pancit and lumpia! This is one of my favorite Filipino dishes. 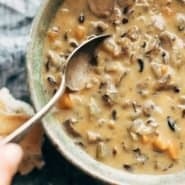 It’s tasty, easy and it is so versatile too. Enjoy! PS- The carnitas were a big hit in my house!! Made up the tamale pie with the leftovers.. sooooo goooood!!! YUM!! I am vegetarian, and when I visited the Philippines, we had pancit with fried tofu. LOVED it! I absolutely LOVE pancit. A Filipino with whom I used to work made it for each work potluck. A friend here in Sacramento is Filipino, and when she found out how I dearly loved it, always drops by at least a quart of it. Hers has oodles of very thinly veg and very little oil (doubt she really stir-fried the entire dish.) I also love Lumpia stuffed with veg. She’s given me frozen bags of them. Due to the many steps they always make a ton. I throw the lumpia in the freezer. Traditionally they are fried, but we had lovely results brushing the frozen lumpia and baking at 400F until golden brown. You will have fun getting to know all the lovely ingredients over there! Thanks for your awesome blog. Love ethnic foods! Your shrimp dish looks delicious! I look forward to more Filipino recipes. Such a delicious looking dish + your neighbor is adorable! I loved that he was watching me sans pants. 🙂 No need here for those kinds of things in the Philippines, I guess. Oh my goodness! This was SO good. Both hubby and I LOVED this. Definitely a keeper! I’m so happy to hear that! And guess what? NO JOKE I just made it again for dinner myself. 🙂 Thanks for the comment! I grew up with pancit canton in the Philippines and I think you did a marvelous job with your version. I would happily dig in and try it! It’s nice to know that you are venturing to the local cuisine. Good luck and enjoy!